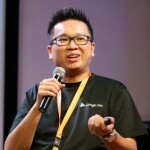 David Yin is business development manager for Google Play Apps & Games in South East Asia and Australia. Prior to Google, he worked as General Manager at Vserv, leading developer partnerships globally focussing on mobile app monetisation and also worked at Nokia leading developer partnerships in South East Asia. David has an MBA from the Australian Graduate School of Management (AGSM) and is an Australian Chartered Accountant.